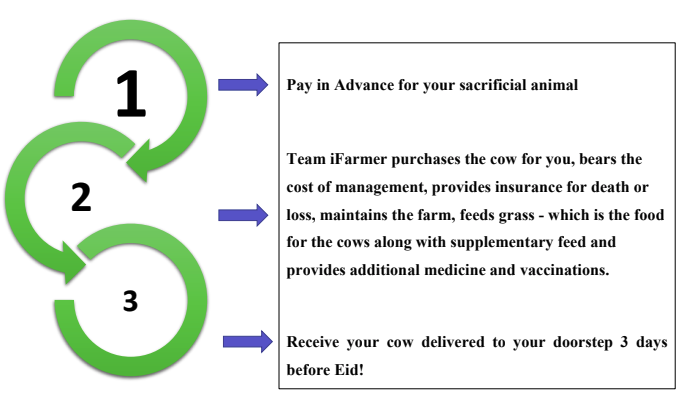 Addressing the need for sacrificial animals during the upcoming Eid Ul Azha, iFarmer took the initiative of launching an online marketplace for cattle aimed to ease your way into finding the right cow at the right time for you without any added hassle! iFarmer consists of an expert team of professionals who are determined to cater to the needs of health-conscious consumers like you. Therefore, we select the best calves and grass-fed them to gain weight and be ready for your sacrifice. We are providing you with a platform which enables you to receive your organic cow delivered at your doorstep 3 days before Eid. 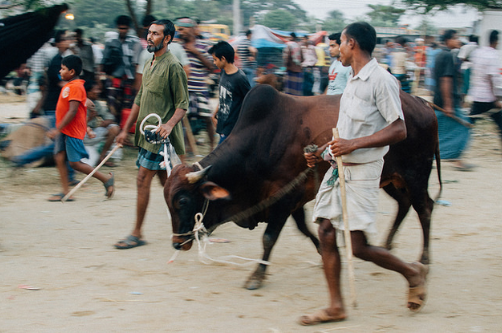 Embrace the true feeling of a sacrifice this year by sacrificing your own cow. Sit back and relax while iFarmer takes all responsibilities of your sacrificial animal through its good practice of bull fattening. We value the sacredness of Eid Ul Azha’s traditions and therefore we are keen to provide top of the line service for our clients! Can I visit the farm/farmer managing my cow? Yes, you can always visit the farm/farmer to see your cow at your own cost. Team iFarmer will guide you with all necessary information on this regard. Do I incur any delivery charge? No, the delivery charge will be fully carried by iFarmer Limited till the cow is dropped at the address you provided. What happens if my cow dies or gets stolen? In case of any unfortunate event as such, iFarmer will replace your cow at its own cost. How many cows can I buy as an individual? As an individual, you can buy 2 cows at max. What is the guarantee that I will receive a healthy cow? Team iFarmer understands the importance of Eid ul Azha. Therefore, we respect your faith and is determined to provide you with the best service by considering the overall emotional attachment to this holy festival. What will be the minimum weight of my cow? The minimum weight of your cow will be 100 kgs (2.5 mon).